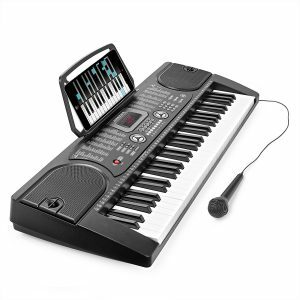 A keyboard offers a convenient way for anyone who wants to learn how to play music. Electronic models are everywhere right now, and they are much easier to use than pianos. Plus, they don’t take up as much space in your home, which, for beginners, is a great plus. Keyboards don’t have the same heavy action as pianos, but they do come with features that make them a good option for someone who needs assistance to start playing music. If you want a good beginner keyboard that will not have you break the bank, the Casio SA76 Mini is an excellent option. This mini model comes with 44 mini keys, as well as five percussion pads. The youngest musicians in the making will have a blast using it, as it is adapted to their small hands and fingers. You will find this model excellent for learning, as it comes along with 100 sounds and 50 rhythms to accompany the learning process. Selecting a tone is easy, and an on/off function is available for melody lessons. The LCD display is comfortable to read and convenient. This model could easily qualify for an instrument that can be more than just for beginners. 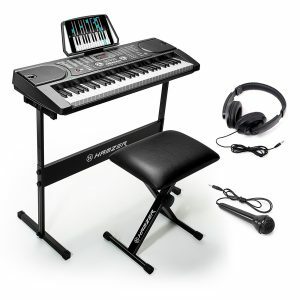 Because it comes with 61 keys, it is a full-size keyboard, which means that it will allow you to learn how to play as if you would use a real instrument. Even if full-fledge pianos have 88 keys, this keyboard takes you one step closer to your goal of learning this type of musical instrument. An important aspect is that you’re paying for a complete kit. You will receive, along with your purchase, a stool, a stand, and headphones. Everything needed to start learning is readily provided. 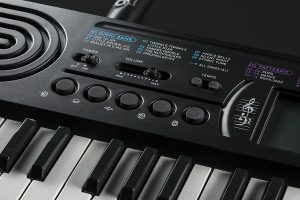 Another model mentioned by the beginner keyboard reviews is the Casio CTK-2550. Outfitted with 61 keys, it is as close to the real deal as a keyboard can be. It must be noted that the 400 tones and 150 rhythm patterns included extend its usefulness, and make it an excellent practice option. The lesson system, however, must be the thing that makes this one stand about, along with the Dance Music mode that lets you mix the music you want to play, as you see fit. Another great thing about this model is that you can connect your headphones for quiet practice. 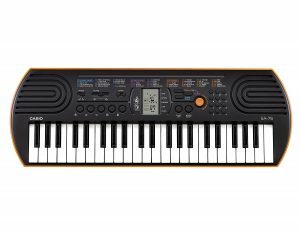 Beginners and intermediate level players will find this keyboard to be quite an excellent choice for advancing their skill. The speakers offer a superior range of sound, something you cannot easily say about other similar musical instruments on the market. What makes is such a good choice, however, is the learning system that will allow you to progress. Outfitted with a headphone jack as well as stereo outputs, this keyboard offers extra features that will convince you it is the right choice for you. Also, the complete setup with a stand and a stool makes it superior to other products. Most keyboards on the market have only 61 keys, at best, but the Flychord DP330 brings you as close as you can get to the performance of an acoustic piano, by coming with 88 fully weighted keys. When you hit the keys, you will feel like you’re playing on a real piano, which says something about the overall quality of this instrument. The amount of extras on this model is outstanding. You can take full advantage of the 500 authentic voices, 200 presets, different user styles, songs, and albums, to create the perfect setup for your practice. On top of it all, the piano sound it can produce qualifies it as an excellent buy. A keyboard is an ideal way for someone who wants to be a musician. Of course, you may want the best beginner keyboard that is out there, to make sure that your practice doesn’t have to suffer from a poorly executed instrument. Shopping for a keyboard entails many things, and not everyone has enough time at their disposal for this purpose. There are various factors to take into consideration, such as pricing, style, number of keys, extras, and features, and that may not always be an easy task. To help you find the perfect instrument for your needs, we decided to look at the models available, as well as the reviews and other information supplied by experts. Even if you are just a novice musician, or you are at an intermediate level, and you want to hone your skills, you will discover that some instruments can cater to all your needs. This was one of the primary aspects we thought about, as we looked for models that represent a sound investment and can be used for a few years. Should you look only for a model that is suitable for young musicians, such models are readily available. When your mind is set on a specific list of requirements, it will be much easier for you to find the right keyboard. From cheap keyboard pianos for beginners to models that are a bit more expensive as they come equipped with multiple extras, we took a look at everything the market has to offer so that we could tell you which ones you should be investing in. Here are the most critical aspects that you should look at, in case you want a keyboard that is most suitable for beginners. How many keys does the model have? An acoustic piano comes with 88 keys, but more often than not, the types of keyboards you will find for sale are outfitted with only 61 keys, or even less, depending on what kind of users they cater to. It would be a stretch to ask from a keyboard the same capabilities as from a piano, which is why one of the main differences between the two major types of instruments is the number of keys. That being said, this doesn’t mean that you will not be able to find a keyboard with 88 keys. Expect, however, such models to be more expensive. They are usually more complicated than the run-of-the-mill keyboards on the market, and they come with multiple features and extras that make the expense worthwhile. There is, however, a critical point in favor of keyboards with fewer keys than what you can see on an acoustic piano. They are easy to play. That is one consideration that any beginner should bear in mind. The less confusing the instrument you want to play, the better. For playing various types of modern music, you can use a keyboard with 76 or 61 keys. However, if you plan to play classical pieces, you will need a full-fledged 88-key model. Also, unless you are ready to pay a premium price, don’t expect your keyboard to sound like an acoustic piano. Just as it happens with acoustic guitars and their electric counterparts, the sound you can produce with each of them differs from one type to another. Are weighted keys a critical feature to consider? In case you want to transfer later to an acoustic piano, you will need to consider this particular aspect. On a piano, when you hit a key, inside the piano, a small hammer will hit a string. A keyboard cannot reproduce the sound obtained in this manner, and the feel isn’t the same either unless it is outfitted with weighted keys. They simulate the same feel and allow you to benefit from an experience closer to that of playing on an acoustic piano. As pointed out, this is a primary consideration if you plan to move to the instrument mentioned after playing the keyboard for a while. Should you decide that a keyboard is an instrument you want to play, ergonomics is another crucial aspect we have to bring up. 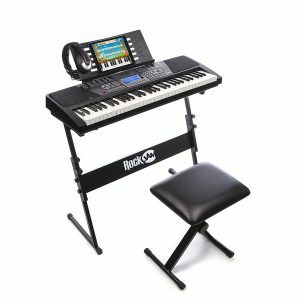 Some models sold at the moment come along with a stool and a stand, and they are considered an excellent buy since they provide the entire setup for a new player to start practicing. Portability is another issue. If you plan to purchase a keyboard that you can easily carry around, it is recommended to take a look at a more compact model. For gigs and concerts, they are the best choice. 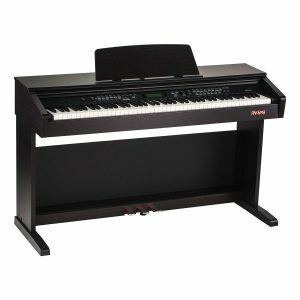 A full-fledged setup that pretty much looks like a piano may not be a good choice unless it is lightweight, and easy to assemble. Let’s not forget that we are talking about instruments that are a good option for beginners. This means that the instrument you pick should be able to help you learn how to play. That is the reason why keyboards usually come with some learning features that can help you make progress. For instance, songs you can play along with should be provided. Also, you should be able to switch from different modes, something that allows you to try out various music styles. Presets should be available, as well, offering you the possibility to practice as if you were part of a musical arrangement. You will notice that the more expensive a model is, the more options of this kind are readily available. Some models can have tens of sounds and rhythm patterns, while others count them in hundreds. Also, some of the more expensive models come with complex learning systems that take you, step by step, through what you need to practice to get better. Let’s not forget about polyphony. The more sounds your keyboard can produce, the more it will be able to reproduce the same sound effects as an orchestra. For entertainment purposes, and not only, such a feature is also considered a must-have by many keyboard players.